Ancient Greeks escape an island that is sinking after a volcanic eruption. 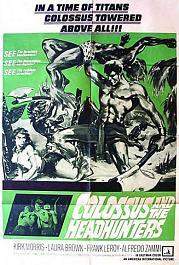 Colossus (Kirk Morris) steers a raft to safety but they are captured by a tribe led by Queen Amoa (Laura Brown) that is itself under attack by headhunters. Colossus decides to come to their aid - and a battle ensues. From a widescreen uncut import print.